fruit = 2 T raisins. An estimated 86 million Americans have prediabetes, and 90 percent of them don't know they have it. Prediabetes can lead to type 2 diabetes and its many serious complications. It's crucial for people to know their risk because prediabetes can be reversed with healthy food choices, weight loss, exercise, and other lifestyle changes and medication¹. 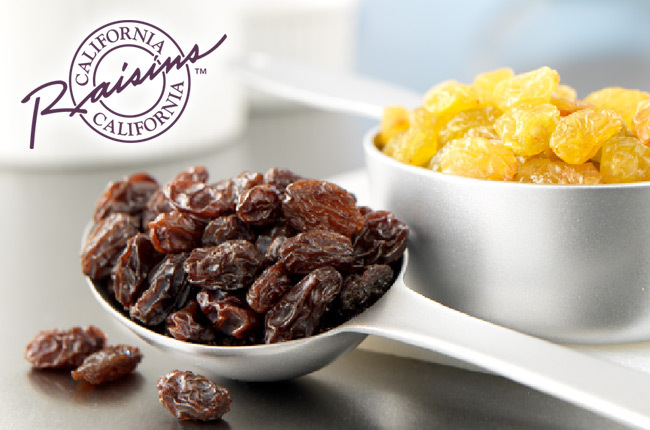 Over the years, California Raisin growers have invested in nutrition research to evaluate raisins' influence on important topics such as diabetes. Research* suggests that raisins may improve glucose levels and systolic blood pressure among people with type 2 diabetes mellitus (T2DM)².
and a significant reduction (8.7 mmHg) in systolic blood pressure. The study was conducted at the Louisville Metabolic and Atherosclerosis Center (LMARC) by lead researcher Harold Bays, MD, medical director and president of L-MARC. Today is American Diabetes Association Diabetes Alert Day®. *Cardiovascular disease is affected by various factors. 2. Bays H, Weiter K, Anderson J. A randomized study of raisins versus alternative snacks on glycemic control and other cardiovascular risk factors in patients with type 2 diabetes mellitus. Phys Sportmed. 2015;43(1):37-43.